Part of the 19th Annual Subtle Technologies Festival, SEAMLESS VISIONS. Digital media, once thought to be fundamentally intangible, has been shown in recent years to affect the physical world in very real and measurable ways. Data transformed into networked, interactive formats in fact have the power to educate, connect, visualize a politic, and produce emotional response. This [inter]web of relations mimics key properties of another technological achievement: textiles. One of the human race's oldest technologies ironically serves as the perfect metaphor for its latest inventions. As the digital age presses on, artists and industry alike must consider the possibility of digital textiles. Entangled in both narratives of past and future, what terms define this ethereal artifact? What does the evolution of textiles from analog to digital media imply or reveal about our own march through time? The artworks featured in this exhibition—woven with light and numbers yet dependent on human presence for their significance—point to the complexity of these questions and begin to elicit new vocabulary for a more hybrid materiality. An essay by Subtle Technologies Artistic Director Zach Pearl accompanies the exhibition. 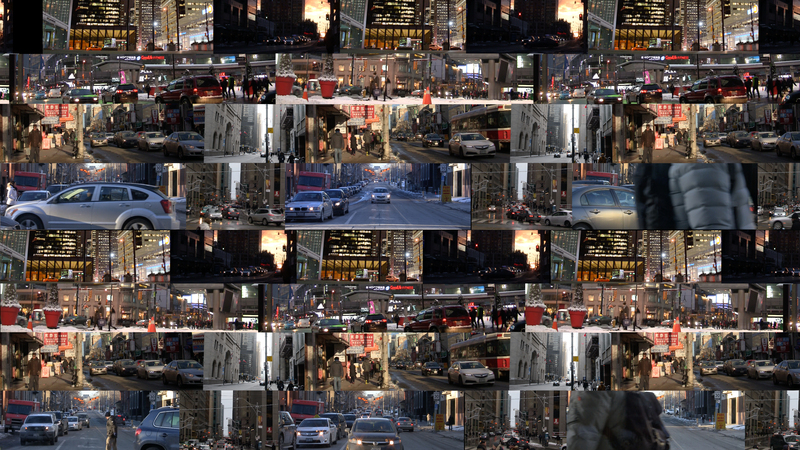 Peter Wilkins, Built Environment Series: Toronto - Cars, single channel video, 2016. 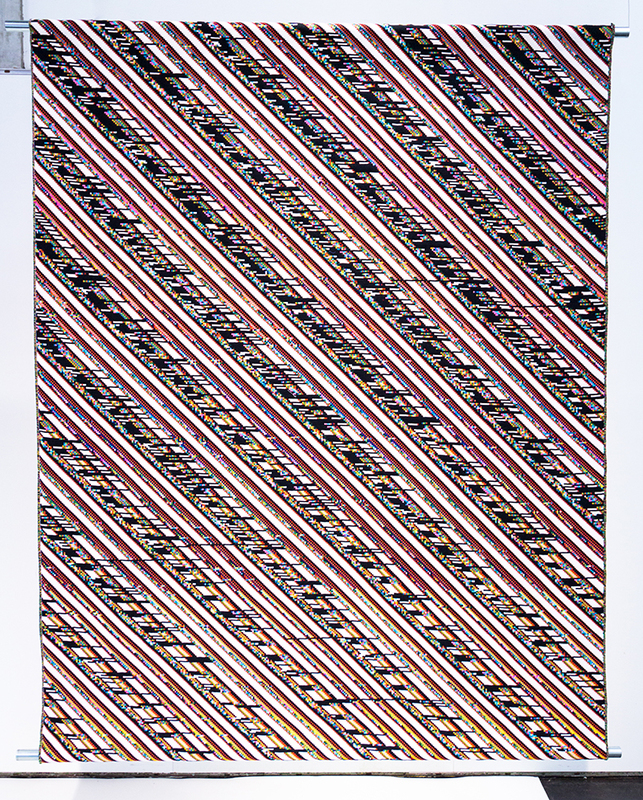 Phillip David Stearns, Vestigial Data (detail), Jacquard woven cotton tapestry, 2013. Phillip David Stearns, Born 1982 Austin, Tx; Lives in Brooklyn, NY; MFA Music Cal Arts 2007. Artist and designer working primarily with electronic technologies and media. His practice spans several disciplines ranging from experimental music performance to interactive light installation, digital art, textile art, expanded media, and post-digital photography. Physics, biology, computer science, acoustics, information theory, media archeology, and philosophy come together in his works through playful experimentation with materials and concepts. Peter Wilkins (British, b. 1968) is a multimedia artist based in Clarke’s Beach, Newfoundland. Wilkins’s various bodies of work have been exhibited in public and private galleries across Canada and abroad, including The Rooms Provincial Art Gallery (St. Johns’, NL), Confederation Centre Art Gallery (Charlottetown, PEI), the Art Gallery of Greater Victoria (Victoria, B.C), and Canada House (London, England). His portrait and landscape artworks are held in public and private collections in Canada, the United Kingdom, the United States, Germany and France. In 2009, he was the inaugural artist-in-residence at Memorial University (St John’s, NL). In 2011, he had a featured exhibition at the Scotiabank Contact Photography Festival (Toronto, ON). In 2013, Wilkins exhibited at the 55th Venice Biennale in the Collateral Event, About Turn: Newfoundland in Venice and in 2015 he had a solo exhibition on Great British Music at the Old Truman Brewery in London, UK. Banner image: Phillip David Stearns, A Consequence of Infinitely Recursive Vision Technologies, multimedia installation (2014). Courtesy the artist.